This photo of a destination wedding bride and groom caught in a goat storm in India is a favorite of mine, and it was chosen to illustrate the feature article on me when I was chosen as one of American Photo's Top 10 Wedding Photographers. This image was taken during a day-after session, and some of the villagers and local children were hanging around to watch. You could have knocked me over with a feather when I realized that hundreds of goats were trotting down the cobblestone road near Samode Palace. I quickly yelled for my bride and groom to stand in the middle of the road, and to look lovingly at each other, as though they were oblivious to the hundreds of goats passing them by. 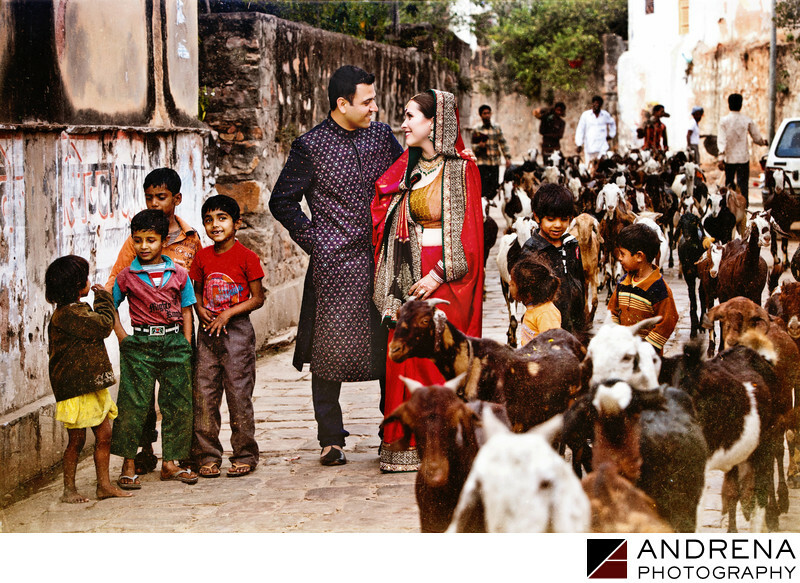 Thankfully, these MIT-educated clients did exactly what I asked them to do, and the end result is an explosion of goats, children, Indian villagers and love that created a memorable destination wedding portrait. Destination Indian wedding photographed at Samode Palace and Samode Village, near Jaipur, India.